Look around any Starbucks, airport or doctor’s office waiting room, and you’ll likely see impatient, frustrated, and angry adults simmering in the presence of children. After all, children are renowned for testing boundaries, pushing buttons and trying patience. This is especially true for kids with learning differences, as they try to navigate a world that doesn’t make sense. But children pick up on our negative reactions, compounding fear and anxiety and exacerbating challenging behavior. They become worried and afraid of the world, avoiding uncomfortable situations and distrusting well-intentioned adults. Worst of all, they lose confidence in themselves. According to The Collaborative for Academic, Social, and Emotional Learning (CASEL), “SEL is the process through which children and adults understand and manage emotions, set and achieve positive goals, feel and show empathy for others, establish and maintain positive relationships, and make responsible decisions.” What’s more, CASEL’s 2011 meta-analysis of over 200 studies and 270,000 students found that those who participated in evidence-based SEL programs showed an 11% point gain in academic achievement. One of the best ways to truly understand the power of SEL is to look at teachers who specialize in teaching children with learning differences. These students often doubt their intelligence, self-worth and social acumen. In order to blend academic rigor with personal growth, it’s essential to connect them to a genuine sense of well-being first. How can these complex and intangible concepts be taught at such a young age? Walk into Christie Ewert’s second and third grade classroom at Sand Hill School, and you’ll notice her contagious energy, passion, and kindness. But her approach to SEL sets her apart. 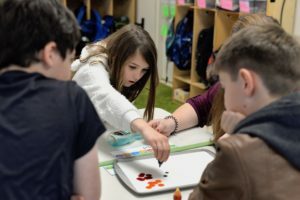 Using both explicit instruction and embedded skill development, she allows students’ personalities to unfold with authenticity. Her theme-based approach to SEL helps students feel relaxed, comfortable and empowered—confidence that often carries over to their everyday lives. By identifying personal stressors, students are able to do a deep dive into coping strategies to help regulate emotions. Most importantly, the students learn that it’s okay to have such feelings and share them with trusted peers and adults. It’s truly inspiring to see second graders find the strength and courage to identify and categorize their colorful list of worries. By the end of the unit, students are self-advocating and planning ahead. Empowering our children with SEL skills teaches self-awareness, self-management, social awareness, relationship skills and responsible decision-making—something we could all use a lot more of (especially at the airport).